Thomas F. Donatucci Sr. Free Library Branch at 20th & Shunk. 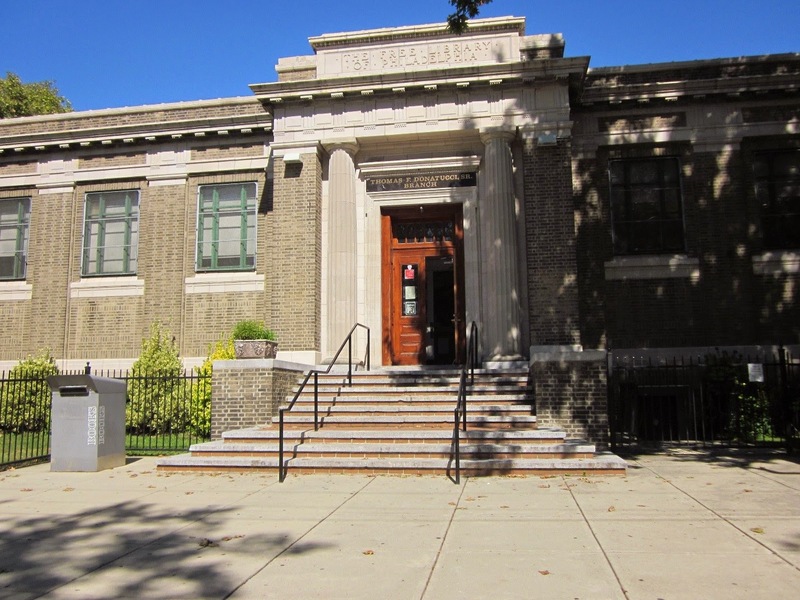 Nestled in the Girard Estates neighborhood of South Philly, the Thomas F. Donatucci Sr. Free Library Branch boasts a garden open to the public Spring through Fall. The Branch Manager, David Mariscotti, encourages the community to enjoy the grounds in reading books, bringing picnics, or just enjoying the fresh air. As one of his many responsibilities, David works with the Free Library's sole gardener and a few dedicated volunteers to maintain the landscaping. To encourage future generations to tend garden, David connected with Marj Rosenblum and together they generated the idea of a Pollinator-Friendly Garden workshop for children and their families. Marj and I worked with David to plan the workshop that took place on May 17th earlier this year. Part 1 featured a presentation on why pollinators are important, how pollination happens, and how to encourage pollinators to visit our gardens. During the presentation, we were pleased to meet a young student, named Sophia, whose school curriculum included work on pollinators! She had much to share with the group on what she was learning in class. The workshop continued outside with Part 2, where we installed a 4'x8' raised bed, planted with nectar-rich annuals such as zinnia; perennials such as columbine, coneflower, goldenrod; as well as butterfly-specific hosts such as milkweed (Monarch), parsley and dill (Black Swallowtail). Of course this was the group's favorite part, and there was much discussion over who got to plant what. All hands on deck! Master Gardeners-in-Training Marj and Stephanie work with support from the Children's Librarian to instruct attendees and their guardians how to plant and select placement. Families were encouraged to check out one of the many resources on pollinators found at the Donatucci Branch, and each child left with a plant to include in their home garden. A satisfied workshop participant with her plant, joined by her father, and Master Gardener-in-Training Marj. This small raised bed contributes to the large garden that already existed at the Branch. Among the many trees and plants found on the property there are native oaks, dogwoods, Black-eyed Susan and Purple coneflower. Now that Fall is upon us, we will take advantage of the perfect time of year to transplant in additional native perennials to attract more pollinators and to fill in the gaps where annuals won't return next year. 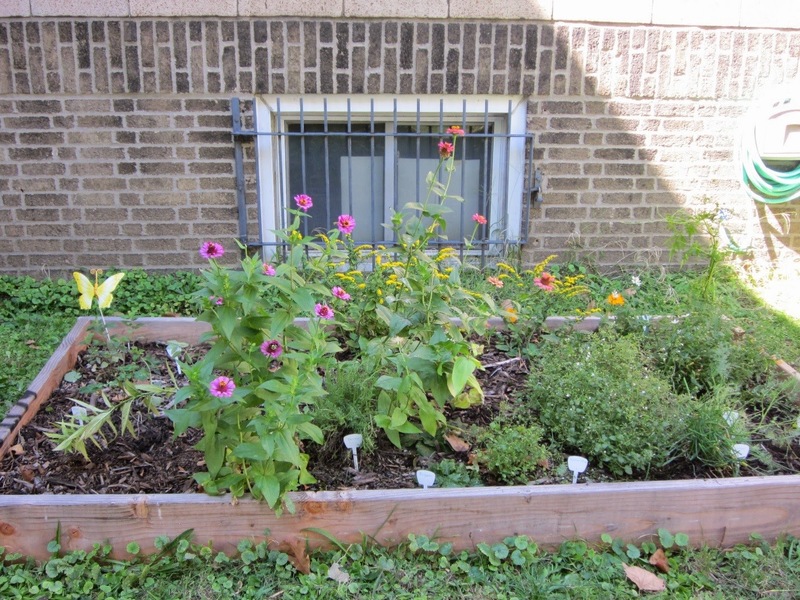 Pollinator-Friendly raised bed in the Fall. Zinnia, Goldenrod, Cosmos, and Calamintha are currently in bloom.